Hard cover book by author George Barnett. Book size is 9" x 11" with 160 pages. Few wild animals capture the imagination and attention of so many people as whitetail deer - especially the spectacularly antlered bucks. Their beauty, grace and majestic appearance leave a lasting impression on those fortunate enough to observe one. Whitetail Monarchs tells the story of these secretive, reclusive creatures interweaving a comprehensive narrative with over 200 absolutely remarkable color photographs of the largest bucks ever recorded on film. 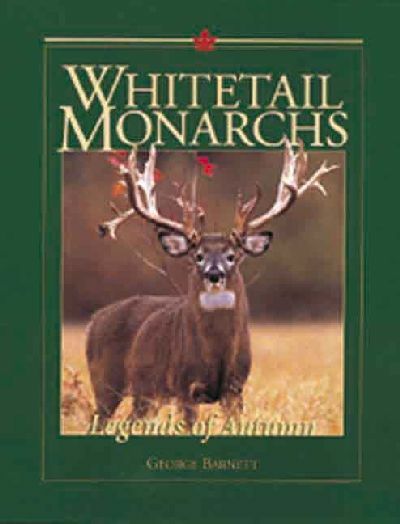 Barnett's comprehensive discussion reveals the behaviors and complex social structures, as well as the rare combination of skills, luck and genetics required to create a whitetail monarch. This beautifully produced book will certainly enlighten and delight nature lovers, sportsmen, and photographers.